As the title says, this is a chart of the size range of everything known, microscopic and macroscopic, on a logarithmic scale. The opaque range for each category indicates the size range of objects that have actually been measured, while the gradient indicates either uncertainty, what may yet be found or what is theoretically possible. Large uncertainties are annotated in the table below, as well as values that I found surprising. The data are mostly from Wikipedia, corroborated with the links given in the annotations. Additionally, a conversion table for all used length units is given. See also The Mass of Everything. Good overview over particle sizes here, especially the particle chart. Simple formula to calculate the radii of atomic nuclei by mass number. This refers only to molecules found in space so far. The largest known molecules, i.e. DNA, measure in millimeters, so there is much room for growth yet. Cell sizes from here. The smallest cell size depends on if Viruses count as cells. The largest, according to this, is a 12m long Octopus nerve cell. According to Larry Nittler, "Presolar Grains in Meteorites", the smallest grain size found is 2nm, but I don't know if this means those grains are meant to be once free dust particles, so I left it approximate. There seems to be a defined Dust/Meteoroid cutoff at 0.1mm in all of the literature I searched (see e.g. here).This is because 0.1mm is the minimum size for an object to become visible as a meteor upon entering Earth's atmosphere. Meteoroids (and Micrometeoroids) are defined as debris from Asteroids or Comets "considerably smaller than a asteroid" (see IMO Glossary). Micrometeoroids in this definition represent the lower range from 0.1-~1mm. For the upper limit see below. I assumed a dividing line size limit of ~10m, as discussed here. As I interpret it, this would mean that comets also range down to that limit. The smallest observed Trans Neptunian Object is ~1 km, but there is no reason to assume that TNOs don't have the same size range as Asteroids/Meteoroids. TNOs include the Kuiper belt, the Scattered disk, the Detached objects and the Oort Cloud. The discovered objects are mostly from the former three groups, with a few possible exceptions. (See Mike Brown's homepage below). The current smallest Dwarf Planet is Ceres at 950km, but according to Mike Brown, "The dwarf planets", TNOs down to ~400km would qualify under the current rules. Giant Planets, Brown Dwarfs and the least massive Red Dwarfs are all about the same size, but of increasing mass, since their density increases with mass. 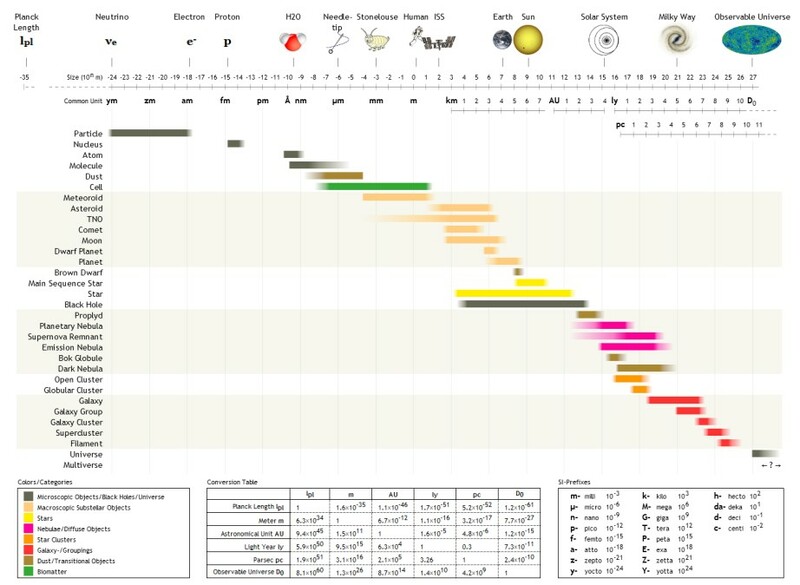 Brown Dwarfs (Wikipedia); Comparison Chart. Supernova Remnants and Planetary Nebulae start off at the size of the originating star and disperse until they are indistinguishable from the interstellar Medium, so the theoretical size range is much larger than the observed one. For the minimum size, see Stan Kurtz, "Hypercompact HII regions"
The maximum size depends on if Hanny's Voorwerp at ~100 kly counts as an emission nebula, raising the limit by orders of magnitude in comparisons to galactic EN's at max. 1.5 kly. (See also 'Protoplanetary Disk') From visual evidence I assumed that Dark Clouds can span the entire disk of their host galaxy (e.g. M104, NGC 5128, NGC 7049, NGC 4526). Also, since Reflection Nebulae are basically a part of a Dark Cloud that is illuminated by a nearby star, and their bounds are not very well defined, they don't get an extra entry. Open cluster stars tend to drift further apart with time, becoming "moving clusters" and loose associations, so the upper limit isn't precisely definable. For the lower limit of galaxy sizes see Steffen Mieske, "Ultra compact dwarf galaxies." Where the cutoff between Globular Clusters and UCDs is or even if there is a continuous transition between them is still a research problem. The largest galaxy known so far is IC 1101. See here for size ranges of galaxy groups, clusters and superclusters. The are the size ranges with the largest uncertainties yet, as they depend on many parameters both observational and physical, e.g. the value of the Hubble constant, Dark matter and what kind of Universe we live in anyway. Filaments or walls as defined here are the largest identifiable parts of the known large scale structure of the universe and include objects like the Sloan Great Wall. 46.4 Gly would be the current distance of the furthest structures we can see as they were ~13 billion years ago. Thus the minimum diameter of the universe right now is ~93 Gly. See: Davis, T.M., Lineweaver C.H., "Expanding Confusion: common misconceptions of cosmological horizons and the superluminal expansion of the universe." 1) Common unit: Unit most commonly found for each kind of object. 2) See John Baez' page for details about Planck length and particle sizes. Black Holes: Karl Gebhardt's "Black Hole Encyclopedia"